Open Daily from 10:00 to 22:00 . Closed on Tuesday . Pizza Discounts Puerto del Carmen - Pizza Delivery Puerto del Carmen Lanzarote Pizza Takeaway . 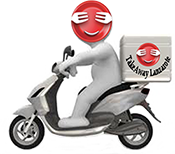 Best Pizza Delivery Takeaway Restaurants in Puerto del Carmen Canary - Best Pizza delivery Puerto del Carmen - All types of Pizza Restaurants Deliveries and Takeaways offering the pizza you love delivered to the comfort of your home or office. Call 0034 691 555 161 or place your order online Puerto del CarmenOrder high-quality takeaway online from top restaurants in Puerto del Carmen, fast delivery straight to your home or office .Get amazing food from an incredible selection of local restaurants .